Mother’s Day and Father’s Day are one or two months away and if you are lucky enough to still have your mother and/or father around now is as good a time as any to think about what to get them. Rather than just picking up something at the last minute from the local drugstore you might want to try to find something a little more creative and relevant for your loved ones. I am reminded of this after visiting the Gift Shop at Leu Gardens last weekend. The place is jammed packed (literally – it’s hard to move around too quickly in there) with all kinds of “gifty” things for your favorite gardener. From accessories to books the variety of items on offer was quite diverse and the store offers gift certificates if you can’t make a decision. Of course, I bring this up because I love museum stores and I’ve recently visited a few interesting ones. Sometimes the merchandise can be pretty pricey but many have a wide range of items that are truly unique to the region or focused on a particular interest. I’ve purchased coasters from the Dali Museum in St Petersburg, Florida, a decorative ceramic tile from the Museum of Fine Arts store in Boston and jewelry from the Metropolitan Museum of Art in New York City. In New Orleans, we visited the Museum Store at the New Orleans Museum of Art (NOMA) and I was sorely tempted to buy a new scarf. I decided against it because I already have quite a collection of scarves. However, my friend did find some beautiful garden tags to label her herb garden. The brightly lit store has a significant children’s section with books, games and toys. Many of these stores offer discounts to members which can be a reason to join if you love the merchandise enough to buy a significant amount of items over time. And, in some cases you don’t have to go into the Museum itself (either via the online store or via a separate entrance to the store on site) to visit the store, thus eliminating the admission to some places. So what follows is a list of some of my favorite museum stores. The Dali Museum, St Petersburg, Florida. Huge store with Dali prints and Dali images reconstituted into all kinds of merchandise. The Harry P. Leu Garden and Museum Store, Orlando, Florida. Small store crammed with decorative garden items and books. The Metropolitan Museum of Art, New York City. Unique jewelry items. Art prints including limited editions, books, toys, clothing and accessories. The Morse Museum, Winter Park, Florida. Tiffany Lamp reproductions and stained glass items. Stationery, apparel and accessories. The Art Institute of Chicago. Beautiful prints and books. Unique jewelry items as well. The Smithsonian, all the museums of this institution have a store but these, located in Washington DC stand out in my opinion. The American History Museum – merchandise changes with the exhibits. Big focus on mid-century modern nostalgic items lately. The Postal Museum – small but focused and perfect for your favorite stamp collector. The Air and Space Museum – freeze-dried ice cream – need I say more? World of Coca-Cola, Atlanta, Georgia. Okay this place is a living commercial for Coca-Cola products but I’m a Diet Coke fiend so if you love Coke memorabilia this is the place to go crazy. Shanghai Museum of Art. You won’t necessarily find any bargains here but what you find is genuine merchandise without the typical haggling and harassment you will find as a tourist in Shanghai. A peaceful place to shop for quality items. This is just a small sampling of what’s out there. Do you have a favorite Museum Store? Every now and then we like to highlight an area of the Orlando, Florida region that is not related to the amusements and attractions area, such as Disney and Universal. We have many friends that have been there and done that and are looking for a different vibe. The Harry P. Leu Gardens are a great place to not only look at foliage indigenous to the central Florida area but the Leu House provides a window into early Florida life. We finally visited this place yesterday after driving past it for the past 10 years and always saying, “we should visit this place one day.” With ideal spring weather we finally took the time to check this place out and we both agree that it is a gem. The gardens are nicely laid out and provide a nice variety of focus areas for particular interests. I found the Vegetable Garden and Herb Garden to be particularly interesting since I’ve had some challenges with successfully growing anything edible in this hot Florida climate. I didn’t see tomatoes but I did see pole beans, cabbage, peppers and sugar cane. The herb garden had basil, culantro, cilantro, rosemary, lavender, and several varieties of mint. These weren’t farm size areas but the kind of size plot one would put together in a larger backyard. And if you are new to Florida and need a sense of what “works” and what doesn’t in this climate, this is a great place to get some ideas. The Butterfly Garden wasn’t loaded with butterflies when we visited but was nicely laid out and was a nice place to sit while taking in the colorful early blooms of Spring. The White Garden seemed a little wilted in areas but the overall effect was nice. The Citrus Grove gave us a chance to see a variety of limes, lemons, grapefruits and oranges up close and it was good to see that the ripened fruit is donated to local food banks. If you like camellias this is the place to visit since it has the largest collection of camellias in the southeast. Leu Garden is also a popular location for weddings and we observed members of wedding parties wandering the park looking for the wedding party preparation area. The present Leu House and Museum located on the grounds was built in 1888 and is on the National Register of Historic Places. Tours of the house are given every half hour and they end at 3:30pm (the gardens close at 5) and they get more crowded as the day progresses. The museum tour is included in the price of the $10 admission to the Garden. The house is generally staged to look like it did in the 1920s with some of the original furnishings and photos included in the mix. Overall it was a nice way to break up our walk through the Garden. We ended with a walk to the Wyckoff Overlook , a deck overlooking Lake Rowena. It was nice to observe turtles chasing each other in the water. I suppose that at times there are alligators in the area but there weren’t any at this time. May is alligator mating season so they should be more visible at that time. I’m looking forward to our next visit at another time of the year when different flowers and roses will be in bloom but I think I’ll avoid the alligators. It’s been quite a while since we’ve written up any of our travels. We’ve been traveling quite a bit lately but we’ve been time-challenged to put all our experiences in “print.” But, I’ve been verbally regaling my friends with some of our old and new travel stories and most have said they should be written up, so we are going to try to get back on track with this. We kick off this year’s stories with our most recent trip to New Orleans, Louisiana. This is not our first trip (I think it’s our 5th) and it was instigated by my having to attend and present at a conference located not far from the Superdome. Art got the chance to visit some museums while I was working and we got together in the evening to eat dinner and exchange our stories for the day. We reserved two weekend days to go places together and by the end we realized that we pretty much ate our way through New Orleans (something we always do). The good news is that we ate at some new places instead of our “favorites.” That’s mainly because we couldn’t get a reservation at Mr. B’s Bistro, where I salivate over the BBQ Shrimp. BBQ Shrimp in New Orleans is not like shrimp on the grill. It’s swimming in butter, spices and Worcestershire sauce. Messy but gooooood! So I was a little disappointed that I wouldn’t get to sit down to, what I consider, a dream meal. We instead were treated to some new dreams. Our first dinner was complements of an industry association that I belong to and was reserved for the Fellows of the association. We were celebrating 50 years of “Fellowdom” at Emeril’s Delmonico restaurant in the Warehouse District of town. Art and I are Emeril fans so we were stoked for a great meal and got it. Starters just kept being presented at our table before we ever made a commitment to ordering anything off the 4-course limited but inspired menu for the event. Jerk Chicken, Spicy Shrimp, Crab Balls, and more were constantly being replaced along with the wine. Spicy but not so spicy that your eyes would water. I picked the Delmonico Chicken Clemenceau entrée and it was deliciously accented with ham. I topped it off with a small creme brulee – not really remarkable but nice to end with. Overall, a wonderful dining experience and the chance to see old friends. The next night Art ate at the hotel restaurant, Lüke. And even though he had a hamburger, I know he had a better meal than I did. I went to a conference event at Mardi Gras World. This place offers a behind-the-scenes look at the Mardi Gras floats when they are not on parade. The floats were beautiful and the place was huge but the food was less than stellar. Not bad but on par with what you can get at the Convention Center. However, Art’s hamburger was a thing of beauty and he was thoroughly satisfied with his meal. The final day of the conference we dined at GW Fins. The conference finally over, we made our plans for the weekend with a friend of mine who was also attending the event. We had heard good things about this restaurant and weren’t disappointed. This was not a cheap place and on par price wise with Emeril’s, but well worth it. Art, of course, ordered the most dramatically presented appetizer, Smoked Oysters. You can smell them as they are being brought to the table and smoke wafts throughout the dining room for at least 3 minutes. He loved them. I had the Wood-Grilled Gulf Shrimp. Less dramatic but just as tasty. We all had some form of snapper for dinner. Art had the Jolt Snapper, which was an evening special, while I had the Red Snapper with Shrimp Etoufee and Jasmine Rice. The Jasmine rice was a little too sticky for my taste but the rest of the dish was excellent. Of course, we had dessert – even though we really didn’t need it. I decided to go with the Coconut Sorbet – refreshing and creamy and Art went for something called the Salty Malty. The Salty Malty was a pie with a pretzel crust and malt-flavored cream filling. A sweet salty taste treat. Reading this you would think that all we did was eat during this trip. Eating in New Orleans is definitely a memorable experience but we had a great time walking along Royal Street in the French Quarter and checking out the antiques stores. One standout was M.S. Rau Antiques. We were definitely just window shopping at this place. It’s like walking through a decorative arts museum except that all the items are for sale. Definitely worth stopping for. On Saturday we did more walking and riding and less eating. We picked up a $3 unlimited-ride day-pass for the streetcars and buses at Walgreen and were set for the day. The three of us headed to the New Orleans Museum of Art (NOMA) and Sculpture Garden via the Canal Street Streetcar. The Sculpture Garden is free to the public so we checked that out first. Serenity is the key word here with some visually striking art along the way. This particular weekend the NOMA was not only filled with its regular artifacts and exhibits but beautiful flower arrangements were displayed in each of the exhibit areas and added liveliness to the place that enhanced the objects on display. (Bring your AAA card to save $2 off the adult admission or look for a coupon on one of the local tourist maps.) The rest of the afternoon was spent riding the different streetcars and buses through the Garden District, with its magnificent houses and parks. This area is a beautiful counterpoint to the rowdy French Quarter (especially on Bourbon Street). The parks are quiet and the atmosphere is far less frenzied. We ended our day at the Superior Seafood Restaurant where I was able to dine on some BBQ Shrimp – on par with Mr. B’s Bistro and costing about $5 less. Even though it’s not in the heart of the tourist district this place was still very busy (and a little loud) and had a great menu for seafood lovers. And, being located on St Charles Street, within an easy walk to a Streetcar stop, this place turned out to be very convenient. Our hotel was located on the same streetcar line and it was an easy trip back. A full day of traveling all over New Orleans for $3 a person – we were literally back on track (streetcar track – that is) to enjoying New Orleans just like in days gone by. Dragon Land Superior Jade – near XiGuan Roundabout, Changping District, Beijing. Orange County Regional History Museum – well worth the trip. The Orange County Regional History Center is a fascinating museum right in the heart of downtown Orlando. A trip up the elevator to the 4th floor brings one back to the very early days of Florida. Tattooed, pierced and adorned with shells the Timucuan Indians were the first the Europeans came in contact with. Today one can find Floridians who are tattooed, pierced and adorned with shells. Sometimes it seems as much as things change they stay the same. The 4th floor has interesting exhibits on the First Peoples, the European First Contact, Florida Seminoles, Pioneers, and Citrus and Cattle industries. I learned some interesting facts. That no spot in Florida is more than 60 miles from the Gulf of Mexico or the Atlantic Ocean. That many of Florida’s 7,800 lakes are water filled sinkholes such as Lake Eola, Lake Apopka and Lake Conway. And to reduce the mosquito population, hang a dry hallowed gourd to attract mosquito eating Purple Martin birds. Who knew that late 19th century Kissimmee had the Country’s first “Ride-Up” drive through saloon where thirsty cowmen didn’t even have to dismount their horses to buy a drink. The third floor includes Orange County’s old courtroom (the museum is housed in what was the old court-house). 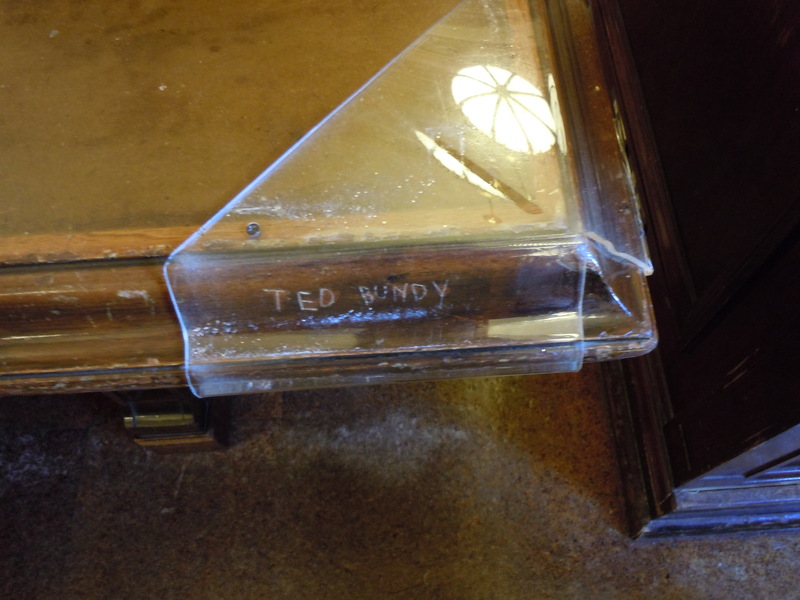 It was educational to see the old style courthouse and see Ted Bundy’s name scratched into the defense table. On this floor there is a transportation section with old train and steamboat exhibits, tourism before Disney, Central Florida through the wars, then Aviation and finally Disney: The Day We Changed. The second floor had a Road To Modern Orlando Timeline, an extensive African-American Heritage section, and houses the special exhibits gallery and changing exhibits gallery. There were “old school” video games. Pinball machines, Pac -Man and others that were enjoyed by all. Exhibits on Jack Kerouac the famous writer and poet, Orlando Magic, Military, Disney and Tourism. The museum is easy to reach, right off the I-4 highway, and parking is available in a public parking garage a block away and across the street from the Orlando Public Library. The museum is open Monday – Saturday, 10am -5 pm. and Sunday, noon to 5pm. Admission is $9.00 , seniors (60+), AAA, military and students $7.00, $6.00 for ages 5-12, and free ages 4 and under. It is well worth the trip and all ages will enjoy it. Lunch time at jury duty found me visiting the Seminole County Museum that was close by to the Seminole County Courthouse. I entered with low expectations and was pleased to see that the museum was very interesting. Packed in this small museum are historical photos, artifacts, maps, documents and exhibits of early Central Florida. The St John’s River was the gateway to Central Florida from the Atlantic Ocean. Included were exhibits on Native American artifacts, railroads, steamships, early settlements, agriculture and other industries and decorative arts. The museum is at 300 Bush Blvd Sanford FL ( US 17-92 ) and is open Tuesday – Friday from 1pm-5pm and Saturday from 9am – 1pm. Admission is only $3.00 and $1.00 for children 4-18 and students. We like museums and here is another one located in the Orlando, Florida area that we have visited. Hours of Operation: Tuesday – Saturday, 10:30 am – 4:30 pm, Sunday, noon – 4:30 pm, Closed Mondays and major holidays. Children under 12: Free; Members always admitted free. Focus: This small museum, run by the city of Orlando, is focused on showcasing works by American artists. Permanent exhibit is devoted to the paintings of Earl Cunningham (1893-1977). True examples of American Folk Art, many painted on board vs. canvas, these bright paintings mostly all have a link to the water. Typical Amount of Time to Go Through the Museum; Even if you read all the little white cards, this small museum should only take about 1 hour to an hour and half to cover. All exhibits are located on one floor. Children’s Activities: None really observed but some special events may include children’s activities. Café or Food on-site? No. Gift Store? Yes, very limited but interesting collection of American Folk Art items that change with the seasons. Although the museum is somewhat small, the Cunningham collection was strikingly colorful, setting a tropical tone, even though not all scenes are of tropical locations. Many scenes feature some link to the water whether on a dock, in a marsh, on a river or a sunset on the Gulf. The museum also does a very good job of educating the viewer about Mr. Cunningham’s life and motivation behind his work. The special exhibits change throughout the year. Overall this museum is worth a short Sunday afternoon visit. A walk around the grounds, which abuts a small lake, can also be a peaceful diversion. On a down note some of the outdoor sculpture seemed to be in need of a cleaning. I don’t think the artists really intended for any of their works to become laden with moss or mildew.